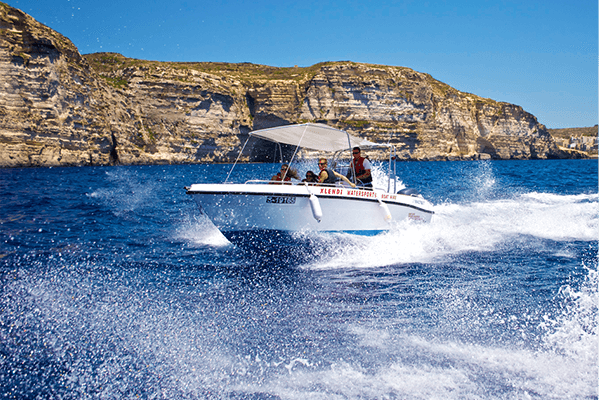 Enjoy one of our famous Gozo boat trips around the Island and its beautiful sister Island Comino. A full or half day trip leaves enough room for a relaxing sunbath, your favourite book and a tranquil dip in the blue. Snorkel along the colourful caves and explore the vivid marine life around the magnificent cliff edges and shallow white or brown beaches. Join in the fresh local lunch on board and socialize in our unwinding atmosphere. While featuring the most scenic beaches, bays and lagoons, a boat trip in the crystal clear Mediterranean Sea is an unforgettable experience for visitors of any age. Discover the well renowned Blue Lagoon in the Comino Island, Wied l-Għasri, Xlendi Bay, the Azure Window and Fungus Rock in Dwejra, Ramla Bay, Marsalforn and the local fishing bay Daħlet Qorrot on your holiday tours around Gozo and Malta.